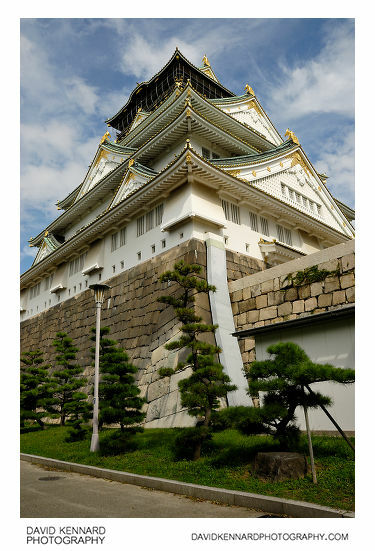 The main keep (天守閣; Tenshukaku) of Osaka Castle has been destroyed and rebuilt several times throughout the castle's life. 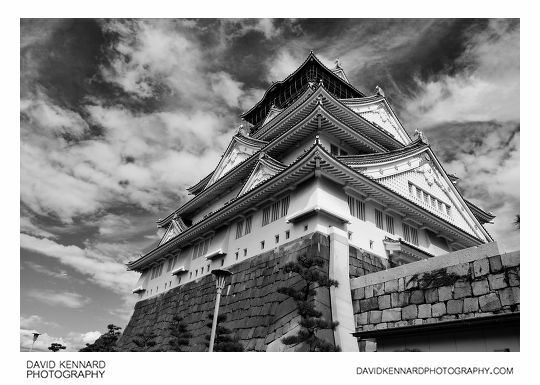 The original Tenshukaku was built at the same time as the castle, in 1583. The castle was built on the previous site of Ishiyama Hongan-ji, a temple fortress that was destroyed by Oda Nobunaga in 1580. 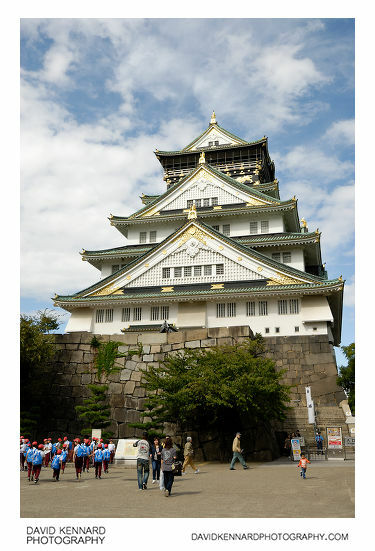 Oda Nobunaga's successor Toyotomi Hideyoshi then went on to build Osaka Castle. 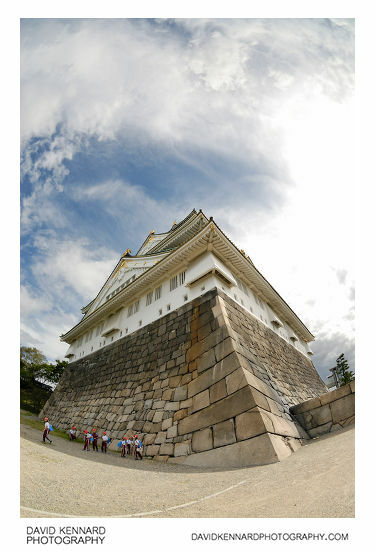 He aimed that Osaka Castle should surpass Azuchi Castle, the headquarters of Oda. 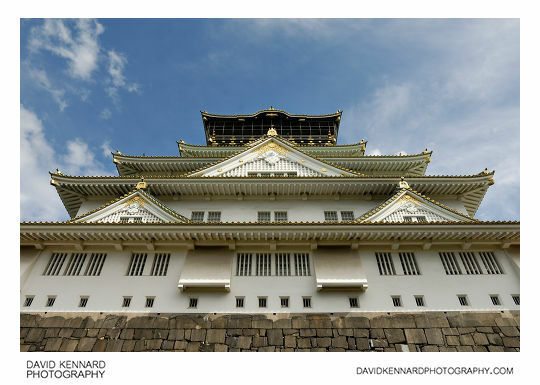 The main tower of Osaka Castle was completed in 1585. It was built with five stories above ground and three below ground. The outside of the tower was decorated with parts covered in gold leaf. In 1615 the original Tenshukaku was destroyed when the castle was taken by Tokugawa Ieyasu, founder of the Tokugawa shogunate that went on to rule Japan for over 250 years. 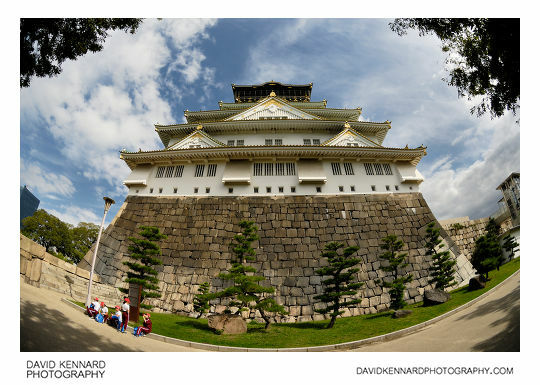 Five years later his successor, Tokugawa Hidetada started to rebuild the castle, and the new castle keep was completed in 1626. Then in 1665 the second Tenshukaku was destroyed when it was hit by lightning and burnt down. 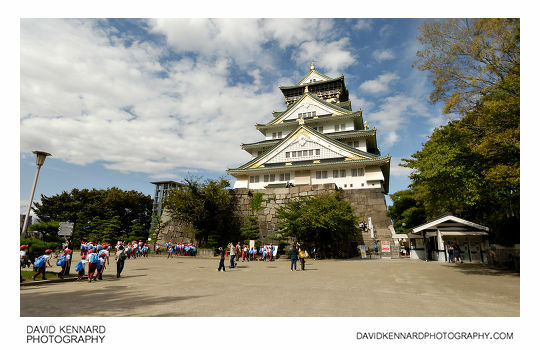 Osaka Castle was then without a main tower until 1931 when the Mayor of Osaka went on a fundraising drive to have the tower rebuilt. In the above photo I am not particularly happy with the composition - I would have preferred the castle nearer the left edge of the photo with space on the right for the tower to 'look in to'. Unfortunately there is a large modern lift just to the right, so I chose this composition to avoid including the lift. When the tower was rebuilt reinforced concrete was used, so the tower is not a completely faithful reproduction of the original in terms of construction methods at least. The castle tower then underwent a major renovation in 1997. This involved replastering the outer walls, restoring the ornamental fixtures, and reapplying gold leaf to the fixtures. I took a lot of photos of the castle tower, but it's a great looking building.